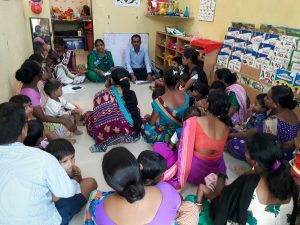 Sessions on raising awareness about Fundamental Rights and Duties with special emphasis on identification of Human Rights violation was organized for parents of our preschool children on 19th and 20th July at Phule Nagar, Powai. Five interactive sessions were planned and implemented by the Jump2Justice project team to empower 94 beneficiaries with essential information on their Right to Equality, Right to Freedom of Speech and Expression, Right against Exploitation, Right to Freedom of Religion, Cultural and Educational Rights and Right to Constitutional Remedies. Participants found the sessions extremely informative and valuable especially since most parents were unaware of their fundamental rights. During discussions, examples of human rights violation cases in communities were shared to inform participants on the consequences and issues that follow when citizens are uninformed about their rights. Solutions that citizens can utilize to claim their rights at the time of violation were also explained. Beneficiaries were explicitly advised to notify concerned authorities and the Jump2Justice team if they witness any human rights violation in their families and communities. The event was highly helpful in increasing beneficiaries’ knowledge and encouraging them to claim their rights and Jump to Justice! Previous PostMumbai Smiles wishes all our teachers a Happy Teachers Day!